In Riviera Nayarit luxury is our nature, a privilege for this destination. In order to preserve the environment, this Friday July 26 at 8:00 pm will take place the first official turtle release at Nuevo Vallarta’s Camp, located at the beach beside Bahia del Sol Hotel, as a part of the Environmental Educational Program developed for the Blue Flag Certification. The beaches at the hotel zones constitute excellent arrival areas for sea turtles, and the only thing you have to do is stay up the whole night a few feet away from your hotel room to see turtles laying their eggs. Biologist Adrian Maldonado, from the Technological Institute of Banderas Bay (Instituto Tecnológico de Bahía de Banderas or ITBB), stated that the results of a study show that Nuevo Vallarta holds a higher number of arrivals than less developed areas like El Naranjo Beach, which is close to la Peñita de Jaltemba. The historical data analysis for the past 10 years indicates that sea turtles set an average of 403 nests per mile in Nuevo Vallarta's 8.7 miles of beaches. In 2007 only, about 6,000 Olive Ridley turtles arrived at this location. The numbers presented by Maldonado are not exaggerated. In 2009, official evaluations at the turtle camp in Nuevo Vallarta estimated by October, close to 4,000 nests had been recovered and 200,000 turtle hatchlings released. "At this camp, the numbers grow every year. What I can say for sure is that the number of recovered nests has grown 600% in the eight years that we've been working here", said biologist Antonio Razo, who then was in charge of safeguarding these beaches. 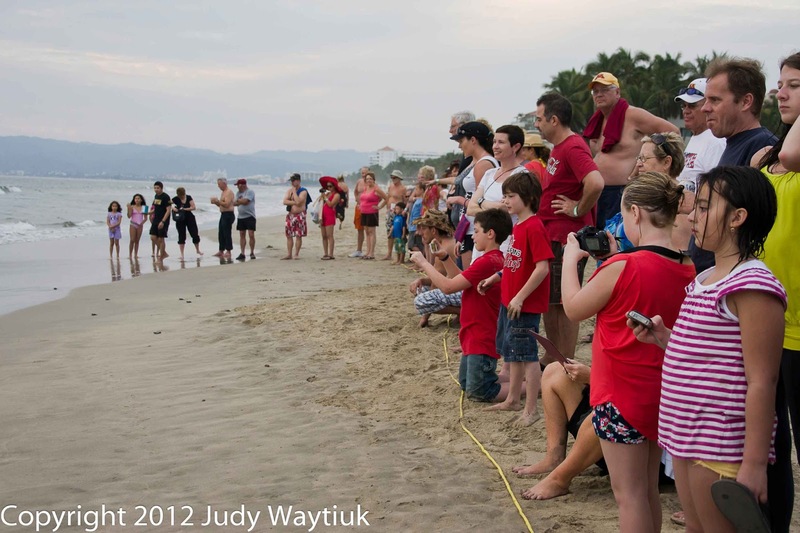 Once the incubation period is over and the eggs hatch, the Nuevo Vallarta camp offers the general public the opportunity to release a hatchling. The release program includes afternoon sessions that start around 6:00 PM if you pay the federal tax, which is used to keep the camp running. Nuevo Vallarta isn't the only developed beach that offers the general public this privilege; other beaches include El Anclote, Punta Mita, Bucerias, La Cruz de Huanacaxtle and other developed areas. At Las Tortugas beach, where a nature-conscious development is taking place, 2,400 nests were saved in 2009. Even though hotels located in Rincon de Guayabitos don't have the largest arrival numbers, the experience is especially exciting at El Naranjo Beach, where one of the most committed protection and education programs has been established. Visiting El Naranjo is not only a delight for tourists, but it's also a truly enlightening experience. The studies made by the ITBB shed light on a fact that even scientists can't fully comprehend yet: sea turtles don't seem to be afraid of touristic developments. Amongst all the beaches in this region, the largest numbers are arriving at Nuevo Vallarta, where the beach has artificial lighting, a fact that was completely unexpected. "An unfinished university thesis study focused on measuring the intensity of light on nest sites, and oddly enough it found that turtles prefer to lay their eggs in beaches that have artificial lighting. However, there is something we have to take in consideration: turtles have a natural aversion to light, so these results are even more surprising", commented Adrian Maldonado.